what’s better than creamy, lava like egg yolk? in my opinion, nothing. it’s gold worthy. in the dark ages i would have bartered egg yolk wrapped in paper packages for all sorts of delicious and worthy trade. i bring you a famous small wonder. the 7 minute egg. it’s the perfect medium boiled egg. and it’s really quite simple. if you have chickens, great! fresh eggs are best. you want room temperature eggs or at least not super cold eggs. 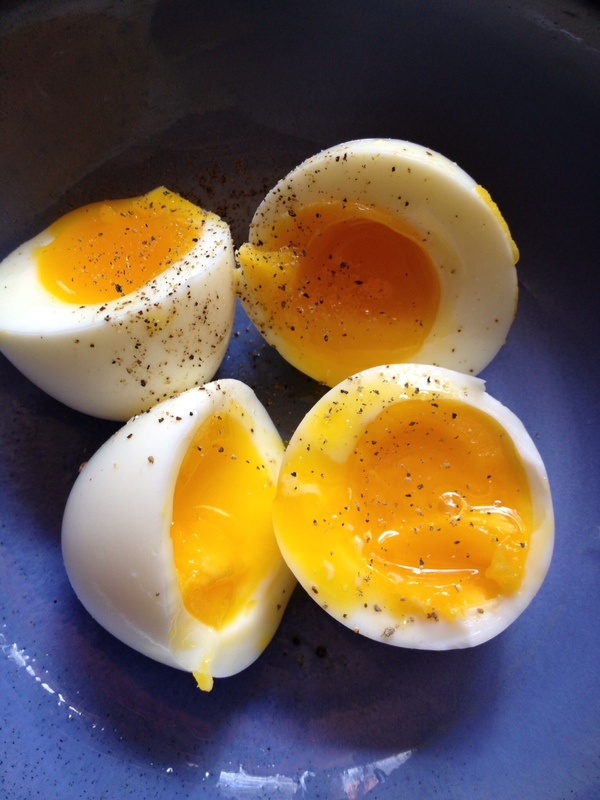 if you only have fridge cold eggs and are in rush, before doing anything put them in some above room temperature water in a bowl. according to how many eggs you want to make fill a small saucepan w/ filtered water and bring to a boil. once boiling, use a slotted spoon or strainer to gently drop eggs (shell on) into water, right before you drop the first egg start a timer for 7 minutes. USE A TIMER. you don’t want to overcook these gems. starting in a clockwise fashion, drop the first egg in and then quickly the rest. once the last egg is in, notice how much time has lapsed. and add that to the final cooking time (usually only 5 – 20 seconds). while the eggs are cooking to perfection. get an ice/water bath ready in a bowl large enough to fit all desired eggs. once the timer goes off, in the same order that you dropped them in, put your eggs in the ice/water bath, usually it will take the same time to pull them out as it did to put them in (i.e. a perfect 7 minute egg). let them sit for 1 minute and then pull them out and dry them w/ a clean dry kitchen towel. they will be good at room temperature for several hours or in the fridge for up to 7 days. i like to eat them at room temperature. they will peel easily, cut them with a sharp knife and add a little salt and pepper. enjoy.